The word “swag” (short for “Stuff We All Get”) refers to insignificant souvenirs, like t-shirts and posters sold at rock concerts. The items in the SWAG for Hard Times collection (lapel pins, bumper stickers, temporary tattoos, charms, and iron-on patches) are similarly insignificant monetarily, but they become meaningful when they’re chosen, worn, and used by you. 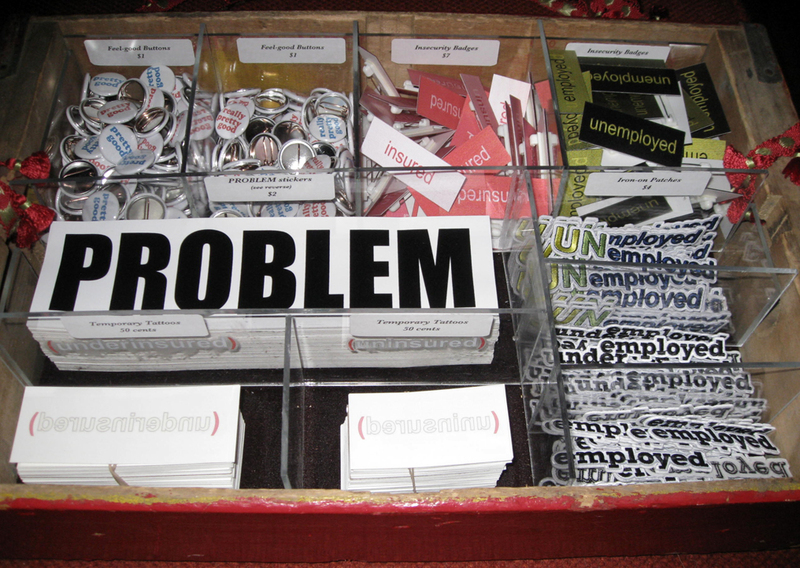 SWAG for Hard Times products are wearable emblems of our precarious economic realities. Our solidarity with one another as we go through hard times is often hidden, and this SWAG intends to fix that problem. Worn as accessories, the SWAG for Hard Times products allow you to share your circumstances with the world. Write and post pictures to this site about your experiences using or thinking about SWAG. Most of all, the SWAG has been created to let you connect with others (in physical space and here, in cyberspace) who share your interest in talking about what’s going on, why, and what we can do about it. SWAG for Hard Times was begun by Sarah Petersen in 2009 while she was living in Minneapolis, MN (her hometown). She now resides in Los Angeles, CA. Through this project (including this website) and the interactions she has as a “salesperson” for her microbusiness/art initiative, she aims to provide a means for others to express their anxiety/disgust and a context through which they might discover others who’ve also had enough, already, of these Hard Times. For more information, contact hello@swagforhardtimes.com.